The F1.4 maximum aperture delivers high image quality in low-light conditions and bokeh-rich macro photography with the minimum working distance of 15cm. Featuring high-speed autofocus, a weather- and dust-resistant structure that can work in temperatures as low as -10�‹C, and great portability thanks to its compact size, the shooting possibilities are further expanded. The optical design includes two aspherical elements and two ED (extra low-dispersion) elements, which reduce spherical and chromatic aberrations to deliver sharp, rich image quality even at the widest aperture of F1.4. The image quality is further enhanced by Fujifilm�fs proprietary HT-EBC coating applied to the all lens surfaces and Nano GI Coating on the rear surface of G1 lens. This alters the refractive index between glass and air, to reduce ghosting and flare from diagonal incident light. 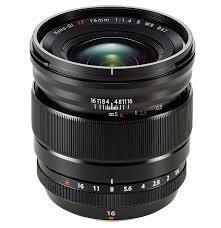 Fuji XF 16mm f1.4 R WR - Seals	The weather-resistant structure features 9 seals in 8 areas on the lens barrel. These keep the lens protected from sudden rain, dust and splashes of water. And the XF16mmF1.4 R WR features a design that absorbs the temperature difference between the outer and inner parts of the lens to minimize the impact on optical parts and also uses electronic parts that guarantee operation in low temperatures down to -10�Ž.